I’m not a fan of most figurines. My mother and grandmother had a lot of those delicate china items, usually depicting women in gowns with umbrellas and kept on tables where little boys could easily knock them to the ground and ruin them forever. I simply have no appreciation for them, perhaps because I grew up afraid that I’d break them. 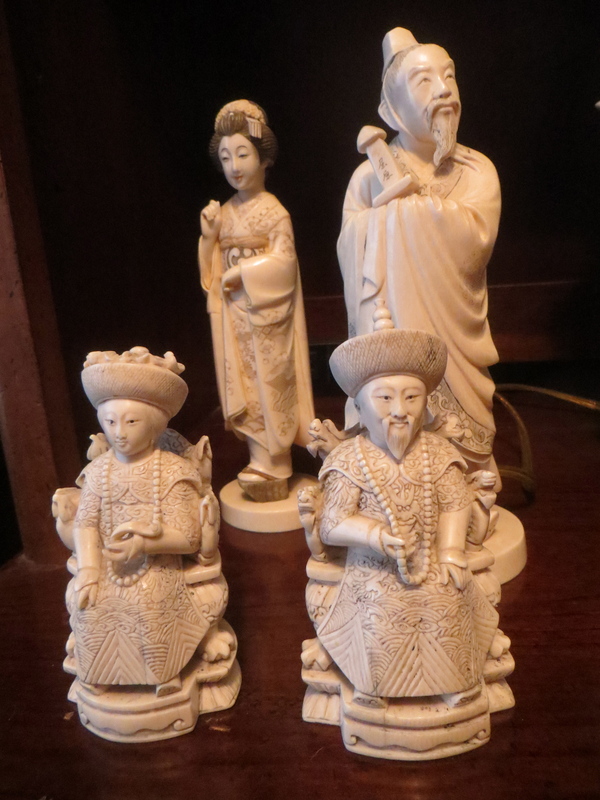 My grandmother also had some interesting carved figures of men and women from the Far East, dressed in traditional Japanese and Chinese garb. I’ve inherited them and keep them on my home desk, and they’ve helped to convert me into something of a fan of figurines. They are exquisitely detailed and — perhaps not coincidentally — sturdy and heavy. I’m not sure what they are made of (bone? ivory?) but they have the feel of age and quality and craftsmanship about them. I can’t tell anything else about them, because they only include Japanese or Chinese characters on the bottom of the base, with no English to be seen. Russell, ever the artist, said something interesting recently. We asked him what he wanted from a particular place, and he said he didn’t care, so long as it was “something beautiful.” That concept stuck with me. It’s nice to have a beautiful thing or two around, to make you appreciate care and detail and inspire you to work a bit hard to bring quality to what you are doing, too.